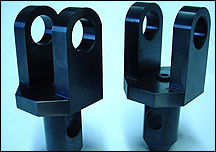 Raymond's Tool & Gage LLC makes a variety of details and machined components to fill virtually any production need. We design and make details of varying size and complexity, as well as replacement parts. At RTG, we can build your parts from existing samples or from a blueprint. If you do not have a print for the part you need, we can reverse engineer and make the part from a sample. We have CMM optical comparator and layout capabilities. We can provide you with a drawing for that component for future reference..